The Creative ZEN line of media players is an interesting counterpoint to Apple's minimalist iPod line. Creative offers a smorgasbord of more features -- like FM radio, voice recording, speakers to share the clips with friends -- in a much wider choice of different shapes and sizes. The "mosaic" name comes from the fun pattern below the display, where the buttons are part of the jumble of grayish squares. The one white square is the center select button, but the four directional buttons do not have the same color, and the only identification is a subtle icon embedded in the surface. As a result, while the menu interface is clean and straightforward, controlling the Mosaic can be frustrating for first-time and casual users -- the play/pause button is particularly non-obvious. The Mosaic also uses a stand mini-USB interface to connect to a PC and to recharge, which should mean that you don't need to carry special cables. But, frustratingly, it does not charge from a USB hub or from USB power adapters -- which means that if you want to use it on a trip, and are not bringing along a computer, you will need to buy and carry the special Creative ZEN charger. 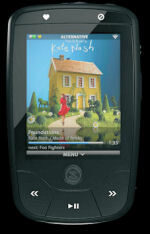 See my Portable Media Players Gallery for more on MP3 and media players. The Creative ZEN X-Fi is a step up from the ZEN Mosaic (see previous post) -- with a larger 2.5" color display, 320 x 240 pixels in landscape orientation. Yet it's still fits comfortably in a shirt pocket at 3.3 x 2.2 x 0.5 inches and 2.4 ounces. 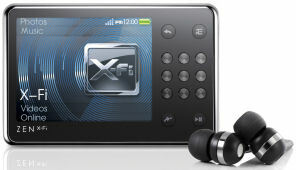 The X-Fi name extends Creative's audio brand with X-Fi Xtreme Fidelity Audio technology to restore the quality of compressed music, plus X-Fi Expand, for a "natural listening experience over headphones that simulates the sound from stereo speakers." The product also includes Creative's EP-830 earphones. The ZEN X-Fi also adds broader native support for video formats (MJPEG, WMV, MPEG-4/ DivX), and includes a SD/SDHC card slot for additional memory. The ZEN X-Fi with Wireless LAN model adds Wi-Fi networking (IEEE 802.11 b/g, with WEP/WPA security). - Chat with instant messaging using Yahoo! Messenger or Windows Live! Messenger, complete with a personal avatar with customized facial features. - Stream or download your own media wirelessly over your home network from a PC running the Creative Centrale Media Server. - Stream content over the Internet from the Creative MediaBox server. However, the Creative server does have some 19 categories, from Comedy and Business, to Health & Fitness and Travel & Vacation, to Music and Radio. But each category seems to only have a handful of options, with some of the more recognizable being Discovery Channel, CNET News, and WGBH Classical. But it's basically a sampler of some content, not a deep selection like you might be used to from iTunes podcasts or Internet radio stations. The design of the controls on the ZEN X-Fi is even more obscure than the Mosaic, which takes some time to learn. It has a unmarked 3 x 3 grid of buttons, plus another pair of buttons above and below with subtle markings (Back, Options, Shortcut, Play/Pause). The middle 3 x 3 grid of identical buttons serves as the control panel, with the center for select, and the middle buttons on each side for left/right and up/down. The left corner buttons then jump to the beginning or end of a menu list, and the right corner buttons jump forward or back one page in a list. The 3 x 3 pad is more useful in entering text for chatting, so you can move diagonally around a virtual phone keypad, pressing multiple times to select a letter as for text messages on a mobile phone. But if you're interested in a fun media player with an attractive combination of features, then do check out the ZEN Mosaic and ZEN X-Fi. The Kodak Zi6 HD Pocket Video Camera, is a bit chunkier than other pocket video camcorders, but it has a lot to recommend it -- including a larger 2.4" display, and the flexibility to shoot HD (1280 x 720) and standard-def (640 x 480) video, 60 fps HD for fast motion, plus still photos (2048 x 1536), with a close-up macro mode (see previous post). My major complaint was that you couldn't silence the built-in sound effects, as it beeped every time you started and stopped recording -- so much for being unobtrusive with a small cam. But the beep is gone with a new firmware update that lets you disable it in the setup menu (see the Kodak support page). However, Kodak is being coy about the upgrade -- it's undated, and described only as "corrects a discrepancy between User's Guide information and actual camera function." See my Digital Camcorders Gallery for specs and comparisons of pocket video camcorders. As promised at CES (see previous post), the Eye-Fi Wi-Fi SD Memory card now can upload video clips as well as photos wirelessly from your digital camera to to your computer, or to a photo sharing site like Fickr or Facebook, or now to video sites like YouTube. The Eye-Fi is standard SD memory card, but with built-in Wi-Fi networking. It comes in 2 GB versions for photo uploading (just reduced to $49 to $99), and in the two new 4 GB (SDHC) versions for video uploading -- the Eye-Fi Share Video for $79 and the Eye-Fi Explore Video for $99 with geotagging and Wayport Wi-Fi hotspot access for 1 year. 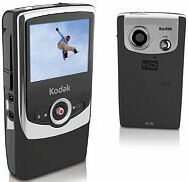 The Pure Digital Flip has helped to popularize the idea of pocket camcorders -- small and light, easy to carry and simple to use -- and now even for shooting high-def video (see previous posts on the Flip, Kodak Zi6, and RCA Small Wonder lines). In addition, the Creative Vado Pocket Video Cams offer a nice blend of features at aggressive pricing: standard definition is now down from $99 to $79 (and a street price of $59! ), and high-def for $229. The Vado HD is just slightly larger and heavier, and both are priced at $229, although the Flip's street price currently is around $209. 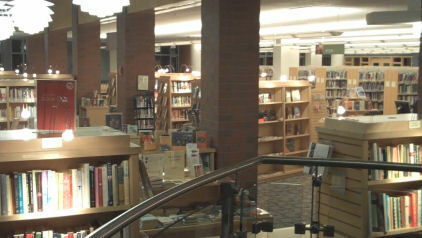 Interestingly, the Vado HD has a significantly wider angle lens than the Flip HD (and the Kodak Zi6) -- the picture is almost a 2X zoom back from the view captured by the other cameras, as in this scene from the Princeton Public Library, shot with the two cameras side by side. With the Vado, you get a lot more of the scene in the frame, but as a result you get less detail (fewer pixels) on any specific element of the picture (like if you try to read the titles on the books). 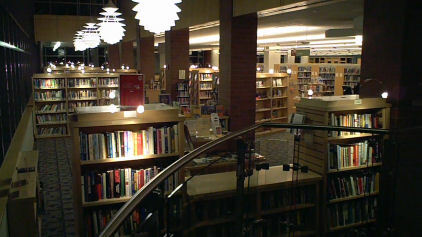 Also note that both cameras did well in the difficult evening lighting conditions with bright lights in the scene. See my Digital Camcorders Gallery for more on the pocket camcoders. Radio used to be about broadcast, and tuning in to one of your favorite local stations so you could choose the kind of music that you wanted to enjoy, depending on your mood -- maybe pulsing hard rock or calming easy listening or stirring classical. But with the growth of national networks and carefully designed playlists for each genre, radio has come to mean listening to pre-programmed streaming music, with some mechanism to choose channels. Yes, you still can tune to broadcast AM and FM radio in your local area, but you can also listen in your car to Sirius XM satellite radio, or can access stations from all over the world over Internet radio, or choose one of 40+ music channels playing different genres on your cable TV. These are all radio, with a growing choice of styles and genres. And you don't even need a radio device -- you can use your computer to listen to Internet radio, or your media player to listen to FM radio, or really mix the models with a device like the Logitech Squeezebox Boom (see previous post), which is a stand-alone radio-like device that plays Internet radio stations (but not AM/FM). And Sirius XM offers portable satellite radio players like the Stiletto 2 that also can play over Wi-Fi, and can store and replay recent programming. And you don't even need traditional broadcasters and radio stations. Internet music services like Slacker and Pandora start with over 100 programmed stations, drilling down into specific genres and sub-styles (see previous post). They then add over 10,000 artist stations, playing music from an artist and others in similar styles. And you can customize your own channels, based on your personal likes and dislikes. This is still radio, and has been licensed by the music labels on that basis -- as a stream of songs that you can't store and replay, except that it's fully custom, and you can pause it, and you can even skip songs. These services play over the Internet to computers, to devices like the Logitech Squeezebox Boom, and to Blackberry and iPhone smartphones. But once radio becomes a stream of music, independent from the source and the playback device, it does not even need to be streaming live -- you could also store it locally and play through it later. This is the idea behind the Slacker G2 -- a portable media player that can download and replay your favorite Slacker playlists. The G2 comes in two versions, with 4 GB of storage for $199 (25 stations / 2500 songs), and 8 for GB $249 (40 stations / 4000 songs) -- with no removable memory card. You select up to some 25 (or 40) genre, artist, and/or custom stations, and it stores some 100 songs per station for you to listen to later. You can update the playlist by syncing with your computer over USB, or the G2 can refresh directly over Wi-Fi. I found the Wi-Fi refresh to be very demanding. The G2 first refused to update over Wi-Fi when the battery was half full. Then it complained about a weak signal at the Princeton Public Library, but then completed the refresh in about 25 minutes (of 10 channels plus a firmware update). The G2 can continue playing as it's updating. Like the Web-based player, the G2 can display artist bios and album reviews. And you can store up to 1 GB of your own music files in standard formats (MP3, WMA & AAC). However, for playback of your Slacker channels, the G2 has stronger requirements to maintain a radio-like experience -- you must play the songs in order, you can't skip backwards, and you can only skip forward a handful of times. The G2 player itself fits comfortably in the palm. It adds a few unconventional keys for a media player, with heart and circle/slash buttons at the top to rate the music (Favorite and Ban buttons). And it uses a scroll wheel to access the menus and select items (by pressing the wheel). 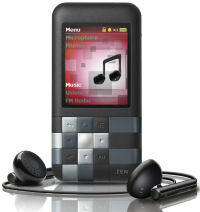 The result is a radio-like experience in a portable player. With the Slacker G2, you get the advantages of radio -- no-hassle selections of your favorite genres / artists, drawn from a huge catalog of music, and with no need to acquire, organize, and manage your own personal collection. And you get the disadvantages -- especially the lack of control over what specific tracks you listen to. But you also can enjoy listening to a changing selection of your kind of music, any time, any where. The Monster Turbine Earphones, introduced earlier this year, are designed as "high-performance in-ear headphones," featuring "specially engineered drivers that deliver impeccable audiophile-quality sound." And priced at $149, they had better deliver, since they cost half again as much as some other quite good earphones that are closer to $100. The Turbines certainly have a great presentation with very nice packaging, framing the earphones and a compact protective case in a soft inner liner. And they look great, with black chrome all-metal housings with a touch of blue and red stripes (for the left and right ears, respectively). Monster touts these as having full dynamic range even from low-power MP3 players, with clean response for low, medium, and high frequencies -- from low-end bass, to mid-range vocals and instruments, to high-end percussive sounds. But the big detail you immediately notice with the Turbines is the bass -- it's much stronger and fuller than you're probably used to being able to hear with typical earphones. Partially as a result, the stereo field also feels wider with the Turbines -- the sound seems to fill a bigger space. If you compare the Turbines with another earphone by putting one in each ear the sound feels off-balance -- the other earphones feel harsher, especially without the full low end. You may not need this kind of performance if you're using your MP3 player on the subway, but for more attentive listening the difference in the Turbines, especially the fuller bass, can be startling. The Monster Turbine Earphones include multiple sizes and shapes of ear tips to seal out noise and a tangle-resistant cable. David Pogue has done it again, with his modestly named David Pogue's Digital Photography: The Missing Manual, part of the Missing Manual series which up to over 90 titles. This book is chockablock with good, clear, sensible advice, highlighting the things that you need to know about using any digital camera -- taking advantage of useful camera features, taking good shots, editing and enhancing with iPhoto or Picasa, and then printing and sharing your images. Pogue is especially good at distilling countless features and options into more focused lists, prioritized by their importance for non-pro photographers. The best bonus is at the end in Appendix B -- "The Top Ten Tips of All Time" -- with simple and common-sense advice and tricks for getting better shots (see them on the O'Reilly site, though without the example photos). Part 1, The Camera, serves as a buying guide for new users, and a handy reference for part-time photographers. After reviewing the different kinds of cameras (point 'n shoot to digital SLR to cameraphone), Pogue stakes his opinions with a chapter on "The Only Features That Matter" -- explaining what's really important in choosing and using a digital camera -- starting with a big sensor (not just megapixels), image stabilizer, zoom power, and shutter lag. Part 2, The Shoot, is a course in photography and digital cameras. It starts with coaching on taking the shot, with extensive discussion and examples of composing the frame. It then discusses "The Ten Decisions" -- how to take advantage of camera features including flash, scene modes, white balance, and ISO / sensitivity. Next is "The Anti-Blur Chapter," dedicated to steeping though techniques and assists for getting clear shots. Pogue then dedicates 40 pages to "How They Did That" -- explaining and demonstrating classic types of professional photos, from frozen action and waterfalls, to dynamic fireworks and car-headlight trails, to classic landscapes and sunsets, to a variety of portrait styles. And for more advanced users, there's "The SLR Chapter," with advice on lenses, compression formats, and useful accessories. Now that you're shooting good photos, the rest of the book moves into working with your photos on a computer to edit and share them. Part 3, The Lab, gets you started with your photos on a computer, using Apple iPhoto or Google Picasa. It starts with the basics of transferring and viewing your photos, organizing and searching them, and then techniques to fix and enhance them, from red-eye to color correction to "cheesy effects." These are presented with iPhoto and Picasa side-by-side, so you can see the common approaches in these and other photo applications. Part 4, The Audience, then is about sharing your photos -- on paper or other printed formats like cards and books, and electronically on the web or in slideshows. I'm running out of metaphors here, to describe the ever-shrinking size of tiny MP3 players. The original Apple iPod shuffle from 2005 was the exemplar of the "pack of gun" form factor (3.3 x 0.98 x 0.33 in., 0.78 oz.). It shipped with a whopping 512 MB of storage for $99, and 1 GB for $149 -- to hold 120 or 240 songs. 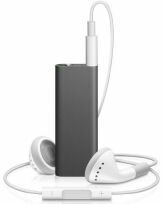 Then came the second generation iPod shuffle in 2006 with the "book of matches" design that was just large enough to fit the control pad on the side. And Apple started describing the size not only in inches and ounces (1.62 x 1.07 x 0.41 in. including clip, and 0.55 oz.) -- but also in volume (half a cubic inch)! 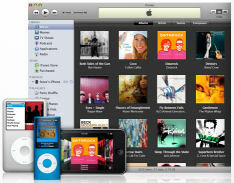 This design was updated in February 2008 to offer 1 GB for $49, and a new 2 GB for $69 (to hold 500 songs). But the idea of a music player without any display hits the wall at multiple hundreds of songs -- Yes, it's fun to randomly shuffle though a large collection of music, but sometimes you're in the mood to enjoy or share a particular song, or artist, or album, or even genre, and skipping one by one though 500 songs just does not cut it. So today Apple announced its solution with the third generation iPod shuffle -- re-double the capacity (4 GB for $79), chop the size in half, and get rid of the controls! Now the metaphor is "smaller than AA battery" -- or, more like the size of 2 AAA batteries (1.8 x 0.7 x 0.3 in. including clip, and 0.38 oz. ), with a volume of a quarter of a cubic inch. Yeesh! Since the device is now too small for a control pad, the controls have been moved to a remote on the right earbud cord. But there's still the problem of dealing with the now 1000 songs you can store in the 4 GB of memory. The answer is a new "VoiceOver" feature that you can enable from the remote, which will talk to announce the songs (with the artist name and title). And just to be extra cool, the song information is spoken in 11 languages, chosen automatically based on the song information. But how can you select from 1000 songs? VoiceOver also enables multiple playlists on the shuffle, so you can organize your music as you want, and then choose the playlist you want to hear by having the shuffle speak their names. This still takes some planning and organization to create the playlists in iTunes, since you can't use default groupings like artist, album, or genre. But it's a clever approach to keeping the teeny tiny music player concept viable. And voice announcements could be good idea for other contexts, such as listening to music from your mobile phone on a wireless headset. 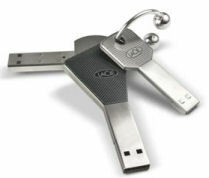 USB flash drives have become ubiquitous, as you can now carry along multiple gigabytes of your digital data. But having all that data in a small package becomes a problem, as it's too easy to lose, and the pain of the loss increases as the drive holds more of your personal data. There have been a whole variety of design approaches to packaging USB drives, from tiny slivers of plastic to deliberately bigger and heavier cases, or as fashion accessories to wear as a necklace or a bracelet. - The LaCie itsaKey (middle) looks like a car key, with a tough nickel surface. It's available with 4 GB for $14.99, or 8 GB for $23.99. - The LaCie iamaKey (top) is thinner but still a solid metal design, with a gold USB connector with protective edges, water and scratch resistant. It's available with 4 GB for $17.99, or 8 GB for $27.99. Both feature fast transfer rates: read up to 30 MB/s, and write up to 10 MB/s. - The LaCie PassKey (bottom) is a microSD USB reader and drive. Just insert a microSD/SDHC card from underneath the head to use it as a USB drive. It's $9.99. Or if you're not the key ring type, you can carry your data along with your loose change with the LaCie CurrenKey USB drive. It has a metal dice-cast construction, just twist to reveal the USB connector. It's available with 4 GB in bronze for $19.99, 8 GB in silver for $29.99. Apple describes its iTunes Store as the world’s most popular online music, TV and movie store, with over 250 million TV episodes purchased and over 33 million movies purchased and rented. Its catalog features over 10 million songs, over 40,000 TV episodes, and over 5,000 movies -- now including over 1,200 movies in high definition video. Titles already available in HD include the just-released Twilight , Transporter 3, and Punisher: War Zone, or you can pre-order upcoming titles, with Quantum of Solace available tomorrow. Consumers do seem to have taken to high def -- Apple reports that over 50 percent of TV programming is purchased in HD when available. You can rent movies from the iTunes Store in standard definition at $2.99 for library titles and $3.99 for new releases, with the HD versions priced at one dollar more, with library titles at $3.99 and new releases at $4.99. You then have 30 days to start watching a rental movie, and then 24 hours to finish it before it expires and disappears. Movies are available in standard def when the DVD is released and in HD within 30 days after release. Or you can purchase movies as permanent downloads. Standard def movies at 640 x 480 start at $9.99, with the new HD versions for $19.99. In comparison, television shows are $1.99 to purchase an episode, or $2.99 for HD (at 720p resolution with Dolby Digital 5.1 surround sound). And all songs in iTunes are 99 cents, including higher-bit-rate, DRM-free iTunes Plus songs (256-Kbps AAC). You can upgrade to the high-quality format for 30 cents a song, or 30% of the price for an entire album. Music videos, and custom ringtones made from songs, are also 99 cents. You then can watch your movies in HD on your Mac or PC computer, or bring your iTunes library to your widescreen TV in HD with the Apple TV (starting at $229). Or play then in standard def on an iPhone or iPod with video. The Pure Digital Flip line of pocket camcorders features an iPod-like approach to product design -- focus on the core essentials by stripping away nice-to-have features to drive a clean and minimal design (see previous posts). Like the iPods, the Flip Mineo (available in standard-def and HD models) has no removable battery and no slot for expandable memory. And it has no options to choose -- for shooting in different resolutions, or still photos, or macro mode. 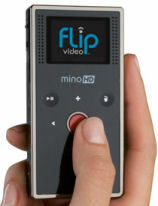 Instead, the Mineo is designed to be easy to carry and dead easy to use, and can shoot for a full hour of video. No wonder the company reports that it has sold over 2 million Flips. So it's not surprising that that the company would make an attractive acquisition, even in the current market. And Cisco announced last week that it would be acquiring Pure Digital for approximately $590 million in stock. But why Cisco -- doesn't it make big iron for Internet hubs? Yes, but Cisco has been expanding in the consumer market as well, including its acquisition of Linksys in 2003 (for home networking gear) and Pure Networks in 2008 (for Network Magic home networking software). And the Cisco consumer product line is more than home networking boxes -- It includes set-top digital video recorders, media extenders, wireless cameras, wireless home audio, and networked media storage hubs. The press release is quite clear about how the Flip extends Cisco's strategy in entertainment and communication, to "expand our momentum in the media-enabled home and to capture the consumer market transition to visual networking." After all, the history of video has been as a mass-market but one-way medium, with television broadcasting and then cable systems. And even consumer-generated media like YouTube is still mostly about millions of people watching clips after their initial upload. But webcams and camera phones and personal camcorders like the Flip offer the promise of personal video feeds -- not 140-character Twitter feeds, but richer video clips. Entries posted to Manifest Tech Blog in March 2009, listed from oldest to newest.